Putrajaya is supposed to be the administrative capital (something like Brasilia). In actual fact, the whole project is extremely controversial and many consider it absolutely unnecessary  especially with the last economic crisis that hit the region. One of the major criticisms of Putrajaya is that the local government for that territory has been taken away from the people and given to a private corporation. Many believe this is just another real estate project (...). On February 1st 2001, a new federal territory was declared by means of the federal government annexing a southern district of the state of Selangor. I have been looking for some information on Internet about the new territory's symbols and flag but I have not been very successful. The closest I came to was from the Putrajaya Official Website which has a symbol that might be the coat of arms for the new territory. 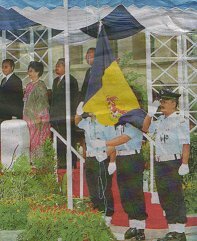 I was also able to scan a photo from a local newspaper that shows the new flag. I attempted to draw the flag and I came up with one that has a ratio of 2:1 which I believe is correct since all Malaysian subnational flags are of this ratio. I had a chance to visit Malaysian new administrative district Putrajaya last week. The Prime Minister's office had been already moved in from Kuala Lumpur and other ministries are scheduled to move in. I could see Putrajayan flags in front of government officers' building and a big new mosque. The flags were waving together with the Malaysian national flag and states' flags. The flag proportion is 1:2 following other Malaysian subnational flags, as Robert Lee reported. Vertical stripes blue-yellow-blue 1+2+1 with Malaysian coat-of-arms in the center but the shade of yellow stripe is darker than our image on FOTW  like the shade of yellow in Sri Lankan national flag. Despite the illustrations you may see on paper, Putra Jaya flags are made with each bar being equal in size as per the image above. Most illustrations show the middle gold bar being square while the two blue bars on either side will appear in a 2x1 proportion, making the collective specs of the tri-bar just like the Canadian flag. I'm not sure which is correct, I only know how actual flags are being made up. On my 3x6 foot Putra Jaya flag, the defacement is 17.5 inches tall by 22 inches wide.